At Adoption STAR, every prospective adoptive parent must complete at least 40 educational credits prior to child placement. Credits do not necessarily equal hours spent on an activity. For the exception of the home study educational classes, couples are not required to complete the same activities. Couples may attend or complete the same or different optional activities, as long as each person ends up with at least 40 credits. The credit system is an honor system. The Agency asks that clients take it seriously as it was created to prepare you for adoptive parenthood and to assure that the best interest of all children are being served. How will I obtain the other credits necessary? You are encouraged and welcome to attend any of the workshops or training activities conducted by Adoption STAR. You will find these listed on the Adoption STAR website calendar. For those interested in pursuing a domestic adoption, this private consultation with an experienced adoptive parent coach and mentor provides a comprehensive training to be incredibly prepared for increasing one’s opportunities to adopt domestically. 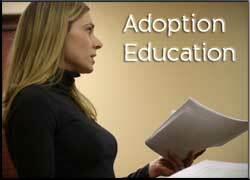 Adoption Learning Partners provides several excellent online adoption courses for reasonable fees. This is an excellent resource for those considering an International Adoption. You can choose to purchase individual courses or a package at a discounted priced for Adoption STAR families. Available as a valuable free resource. A suggested list of CPR educational sites will be provided upon request. A special class geared just for adoptive parents to be and those who recently adopted is offered annually. Join this adoptive family support group (it’s free!) and attend at least one SOFIA event. Meet and talk extensively with an experienced adoptive family that has already adopted from your child’s country and/or adopted a child like the one you hope to adopt. Upon your request, the agency can provide names of adoptive parents who have volunteered to be on a mentor list. Once your home study is approved, join, share and learn from the Adoption STAR Yahoo Group. Pediatrician – Identify a pediatrician who is adoption friendly. If you are contemplating an International Adoption, work hard to identify a pediatrician who has experience with International Adoption. Make sure this pediatrician is accepting new patients, willing to speak to you if you have questions about a referral and be available to see your child shortly after placement. Early Intervention – Whether or not you are hoping to adopt a child with special needs, becoming a parent entails being prepared for potential special needs. Find out how to access Early Intervention services in your county for a child under 3 who may be at-risk for or have special needs or developmental delays. If you specifically are seeking to adopt a child over 3 years old, check with your school district about how to get your child tested for the possibility of delays in development and/or learning issues, and also what kinds of programs are available for children who have general speech delays or for internationally adopted children do not speak English. Child Care – If you will be using child care or day care, locate appropriate services, visit them to see if these meet your needs and your child’s; find out if there are waiting lists or other requirements, and how to sign up to reserve a space for these services after (or right before) your child arrives home. If you are adopting internationally at least 6 of your credits should be related to exploring the culture of your child’s country (language, region, and heritage). If you are planning on a transracial domestic adoption, below are some links to get you started on identifying what cultural activities you may wish to explore. Annually many adoption conferences are held throughout the U.S. Below are a few popular ones. If you identify additional learning opportunities such as adoption or parenting conferences, workshops, seminars, etc., they may be able to count toward your required credits. Each class of 2 hours or more could possibly equal 2 credits. Please speak to your Family Advocate to receive permission to count your additional activities toward your required credits, or for further educational ideas.